“They glorified Mary…we glorified rice.” This quip is the title of Suzann Nelson and Janet Martin’s humorous book about the Lutheran and Catholic cultures of the Upper Midwest. Besides serving as a paean to the Scandinavian immigrant communities of the region, the title highlights one of Minnesota Lutheran cuisine’s most popular contributions: glorified rice. 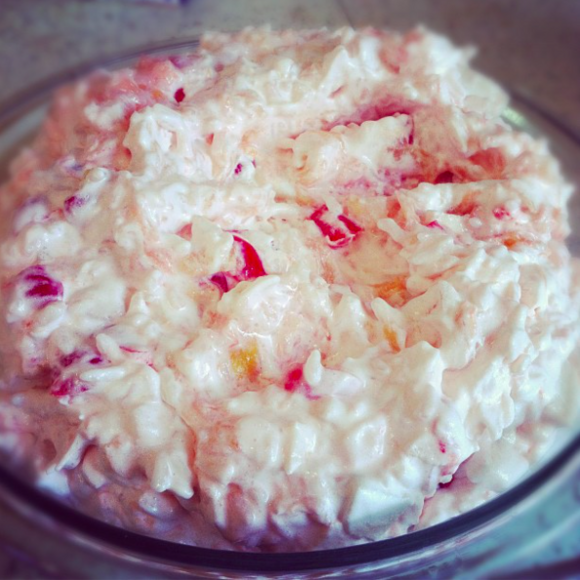 A variation on rice pudding made by combining cooked rice, fruit (usually canned pineapple), mini marshmallows, and whipped cream or Cool Whip, glorified rice is part of the broader Midwestern tradition of whipped topping–based sweet salads and desserts. When Scandinavian immigrants came to the Upper Midwest in the mid-1800s, they brought their taste for gelatinous textures such as lutefisk and creamy rice pudding with them. They also encountered native food cultures and crops, including wild rice, a staple of the Ojibwe people, who were the original inhabitants of the region. As a result of these diverse influences, some recipes for glorified rice call for wild rice, and some, in keeping with Scandinavians’ use of gelatinous ingredients, instruct cooks to add Jell-O to the rice mixture and shape it in a mold. Most contemporary recipes, however, use white rice and ditch the gelatin in favor of a fluffy, creamy whipped cream or Cool Whip pudding. As with other Midwestern Cool Whip mixes, glorified rice occupies an enigmatic territory between dinner and dessert. According to cookbook author Amy Thielen, glorified rice’s customary church potluck placement is after the savory items (including savory Jell-O salad), but before the desserts and coffee, making it a quintessential second-trip-down-the-buffet-line food. The Ojibwe people consider wild rice a gift from the Creator. While it’s now cultivated on farms, they continue to harvest the wild variety by hand every year. Ladled out of massive pots at feasts and fundraisers, the Midwestern stew binds communities. One of the oldest surviving charities in England continues its tradition of handing out free beer and bread.